This is a “party” vibe album, with the first track that sets the tone immediately, right on to the last one. Funky rhythms, Texas shuffle, country blues, blues rock, Southern rock vibes that’ll make you want to dance your blues away! The title track, inspired by the music of B. B. King and Albert Collins. Good timing lyrics about going out for a night on the town with your friends to lose the blues and have some fun. Groovy bass lines and B. B. King-flavoured guitar sets the tone at the first note! Contagious funk groove reminiscent of those 1960s and 70s style go-go dances with “wah-wah’’ guitars and cool bass lines à la James Jamerson (legendary house bassist for the Motown label during the 1960s and 1970s who is still a major influence on many bassists today). Fun lyrics about gambling at a casino with a lovely lady at your side for good luck. A minor blues in a “Latin rock” vibe with guitars inspired by Carlos Santana, and melodies by John Fogerty of the group CCR. Hooky harmonized chorus with bittersweet lyrics and layers of guitars make this song fresh and retro at the same time. A cover song by legendary composer and country singer Hank Williams done in a “Texas blues” feel with soulful and snarling guitar solos inspired by guitar great Stevie Ray Vaughn, an influence of Mike’s. Performed with that vibrant energy that Texas-based bluesmen are famous for and executed with class by Goudreau on this energetic track. The most contemporary blues song of the album, it distinguishes itself by the jazzy chord structures and pop-ish melody for a modern twist along the lines of bluesmen Robert Cray and John Mayer. Features nice sax from David Élias. Hooky chorus with lyrics about addiction. Solid back-beat from Jean-François Bégin on drums that keeps the groove in that hypnotic pocket throughout the song. Swingin’ “jump blues’’ complete with “slap-back’’ echo and a rockabilly twist that will remind you of the 1950s. Burning hot harmonica from Pascal Veillette cooks up a storm while walking bass lines and shuffling drums will get everybody boppin’ to the beat! A collaboration with long-time friend and co-composer Michel Aubin whose lyrics say so well in French what bluesmen write in English songs. 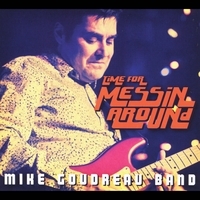 A classic “slow-blues’’ with a few surprising twists, played with great intensity, soul and feeling via Goudreau’s voice and guitar and a well seasoned tight band on this powerful track. A cover of the 1980s hit song by the Canadian group The Rovers. This funky arrangement with superb bass lines from Jonathan Boudreau as well as some kicking Fender Telecaster from Goudreau reminiscent of guitar greats Roy Buchanan and Danny Gatton .is guaranteed to get the party going! Blues rock original inspired by the music of ZZ Top and Southern rock bands like Lynyrd Skynyrd and the Allman Brothers. Beefy guitars with rocking drums. This track will be a favorite for blues fans who like their blues with an rocking edge. Country blues with a rockabilly drive, “slap-back” echo, twangy guitars à la Brian Setzer, and Albert Lee, and let’s not forget the incredible harmonica of Pascal Veillette who proves it is possible to play chromatic lines on a diatonic harmonica! Insane talent and an electrifying performance! The album ends with this funky arrangement of the Beatles’ classic. As major influence of Mike’s writing and singing you can hear his love for their music on this track. Rediscover this cool cover version and “dare you” to sit still!